The use of low-carbon biofuels is one way to reduce carbon dioxide from transport fuels in the coming years. Our joint venture Raízen, in Brazil, is one of the world’s largest producers of sugar-cane ethanol, a low-carbon biofuel. We are also making significant investments in advanced biofuels. 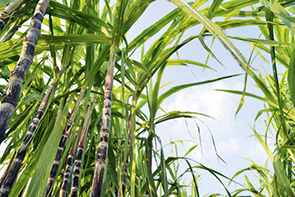 sugar cane to produce low-carbon biofuel. The production of biofuels needs to be managed in a responsible way that safeguards land use, the environment and communities. Overall carbon dioxide (CO2) emissions can differ widely, depending on the raw materials used as well as the production and distribution methods. Shell has been working to improve sustainability standards in its supply chain for many years. In 2013, we used around 9 billion litres of biofuel in our petrol and diesel blends worldwide. We have clauses in our new and renewed contracts for biofuels that we purchase for blending which detail environmental and social criteria. These clauses are designed to make sure that these biofuels are not knowingly linked to human rights violations nor produced from raw materials cultivated in areas of high biodiversity value. More than 99% of biofuels volumes that Shell bought and blended into fuels were covered by our sustainability clauses, with around 30% of this volume certified as sustainable by an independent auditor. We aim to increase the proportion of independently certified volumes (see opinion Sven Sielhorst). We conduct a risk assessment of any new supplier and regularly monitor our supply chain to maintain sustainability standards.